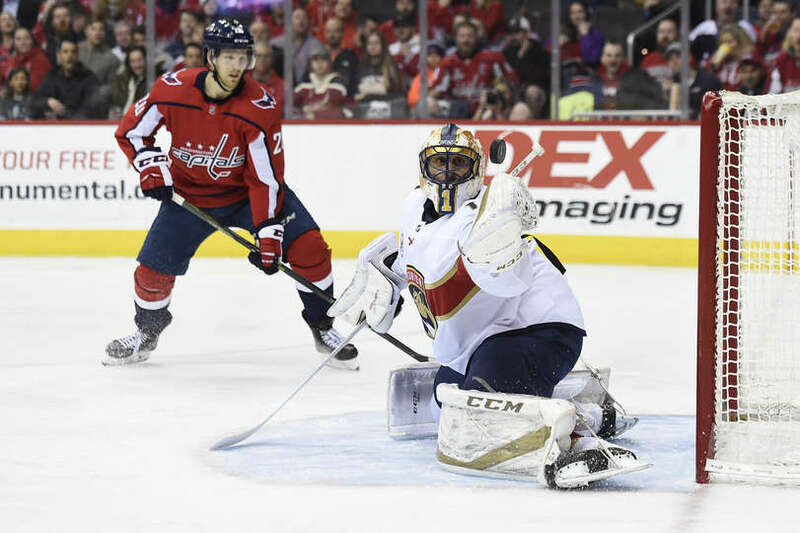 The Washington Capitals fell to the Florida Panthers 5-4 (OT) Saturday night at Capital One Arena. The loss drops the Capitals record to 30-18-7 (67 points). The Capitals are back in action Monday night when they host the Los Angeles Kings in the final game of their season-long six-game homestand. Puck drop is set for 7:00 PM. The Panthers notched two quick tallies in a 35-second span of the first period for a 2-0 lead at the first intermission. Brett Connolly would cut the Panthers lead in half early in the second period, making it 2-1. The Panthers would restore their two-goal lead with a goal late in the second period, but Lars Eller would answer in the waning moments of the period for a 3-2 Panthers lead at the second intermission. The Panthers would stretch their lead to 4-2 before the Capitals rallied with goals from Connolly and Kuznetsov to tie the game late and send it to overtime. The Panthers would win it in the extra frame. Christian Djoos returned to the lineup for the first time since December 11 in Detroit. Djoos had surgery on his left thigh to treat compartment syndrome. For the first time all season (55 games) the Capitals will start their preferred lineup. Djoos’ return to the lineup required that the Capitals to make a roster move, so on Friday they sent Jonas Siegenthaler to Hershey. The Panthers would strike first with a goal from Frank Vatrano at 12:58 of the opening frame. 35 seconds later the Panthers would stretch their lead to 2-0 with a goal from Keith Yandle at 13:30 of the first period. The first period would expire with the Panthers leading 2-0. Shots on goal (SOG) were tied 9-9. The Capitals out-attempted the Panthers 21-16 for the first 20 minutes. Florida was 0 for 2 and Washington 0 for 1 on the power play. The Capitals would get on the scoreboard with a goal from Brett Connolly at 5:02 of the middle frame, making it 2-1. Andre Burakovsky (7) was credited with the lone assist. The Panthers would respond and restore their two goal lead with a tally from Colton Sceviour at 9:17 of the middle frame. The Capitals would get it right back with a goal from Lars Eller at 19:20 of the second period. The second period would conclude with the Panthers holding on to a 3-2 lead. The Caps led 12-10 in SOG for the middle frame, and led 23-18 in shot attempts for the second period. The Panthers struck off the third period faceoff with a goal from Derick Brassard at :07 into the final frame. But the Capitals would respond. Brett Connolly would register his second goal of the game at 6:12 of the final frame, making 4-3 Panthers. The Capitals would tie the game with a goal from Evgeny Kuznetsov at 16:54 of the final frame, making it 4-4. Regulation would end in a 4-4 tie. The Panthers would win it in overtime. Braden Holtby played in his 400th career game. He became the second goaltender in franchise history to play in 400 games (Olie Kolzig: 711 games). Lars Eller cut the Panthers lead to 3-2. He now has points in six of his last seven games against the Panthers (3g, 8a). This entry was posted in News and tagged Brett Connolly, Evgeny Kuznetsov, Florida Panthers, Jon Sorensen, Lars Eller, Washington Capitals. Bookmark the permalink. Why does this team keep shooting themselves in the foot? (Penalties, turnovers and other soul crushing boners)? When’s the last time the Caps came back from a deficit of more than one goal and actually win the game?